Whenever the subject of breakfast comes up, I always feel like I’m harboring a dirty little secret. I don’t know exactly what people expect me to eat, but as a food blogger, food writer and generally adventurous cook and eater there’s an expectation that my breakfast should at the very least be interesting. Surely I’ve encountered so many unusual morning foods in my time that a few have wiggled their way onto my own breakfast plate… right? Sadly, no. While I’ve eaten all kinds of exotic things for breakfast while on the road, when breakfast is on home turf and up to me I tend to rotate between three quite unspectacular things. These are: cereal, usually granola or müsli, sometimes homemade but just as often not; whole-grain toast with either jam or honey; and smoothies, usually featuring bananas, yogurt and whatever looks to be on its last legs in the fruit bowl. On the odd morning that I’m feeling extremely ravenous I’ll whip up some oatmeal, and occasionally on weekends there might be some form of eggs. Whether it’s weekday or weekend, though, and whether I’m peckish or famished, one thing never changes: at least part of the meal must be sweet. It’s like an unwritten rule in the canon of breakfast law that the day must start with sugar, and until recently it never even occured to me to question it. Chances are, more than a few of you will find the idea of sweet breakfasts odd. Maybe not my fellow Americans, or Western Europeans for that matter, most of whom probably share my feeling that breakfast isn’t breakfast without an insulin boost. Beyond that, though, that the majority of the world’s population eats savory things for breakfast. Across Asia people eat rice porridge topped with things like pork and pickled vegetables. In Jamaica they eat ackee and saltfish, sautéed greens and fried bread. In Egypt they eat stewed fava beans. In Japan they eat rice, fish and fermented soybeans. In India they eat everything from potato-stuffed parathas to steamed rice cakes with lentil soup. In other words, there are billions upon billions of people eating exclusively spicy, sour and salty foods to start their day, and as I sat there, slurping down my bowl of peach-melba müsli, it got me thinking: if I’m really as intrepid an eater as I’d like to think, why on earth don’t I work on broadening my palate at the start of the day rather than just at the end? As I discovered, early-morning palate-broadening is easier said than done. I did try: for a week I forced myself to eat nothing but savory food for breakfast: leftover rice and stir-fried vegetables from dinner, arabic flatbread wrapped around olives and cucumbers, instant Tom Yum soup in creamy shrimp flavor. I even drank my coffee bitter. On the one hand, I felt great; with nothing but slow-acting carbs in my system, I stayed full well past lunchtime. Sometimes, I even skipped lunch entirely. The strong, salty flavors also seemed to kick-start my system much more quickly than my usual fare. On the other hand, though, I walked around all week feeling like something wasn’t right. I didn’t wake up looking forward to breakfast, I found that I put off eating it until my stomach was practically digesting itself, and afterwards I felt full but somehow unsatisfied. It was like I was wearing someone else’s shoes, and though they fit, they rubbed in all the wrong places. I kept thinking that in another day or two my appetite would start to acclimate, but when on day eight I woke up craving a frozen-blueberry smoothie like it would be laced with heroin, I simply couldn’t keep it up. To be honest I was shocked and ashamed by my stomach’s stubborn inflexibility, though I’m hoping it has something to do with going cold turkey rather than easing myself into this new way of eating. But I can’t second-guess myself too much on timing since it did have one very positive outcome: in scrambling around for a week’s worth of appetizing, sugar-free morning meals I made the acquaintance of a delicious new addition to my culinary vocabulary called upma. Upma, in case you don’t know, is a breakfast dish from southern India. In its traditional form it’s made by cooking fine semolina with a few vegetables and pulses into a kind of savory porridge seasoned with fried ginger, mustard seeds and curry leaves. The internet is littered with variations on the general theme, though, with everything but the spices seemingly optional, so I decided to use the idea as a sort of take-off point for something a bit more flexible. My version was inspired in part by my own tastes, and in part by the container of cooked oat groats committing hara-kiri in the back of my fridge. However untraditional, it worked spectacularly, tasting kind of like a cross between a savory oatmeal and an Indian-spiced fried rice. The only thing that bothered me was that I found it a little time-consuming for a weekday breakfast, but having the grains pre-cooked definitely helps, as does chopping the vegetables the night before. Once those two tasks are out of the way, upma is actually very quick to throw together, and what you’ll find yourself eating is quite unlike anything you’ve tasted at this early hour: pungent nuggets of ginger and fiery chilies bumping up against sweet green peas, buttery cashews and caramelized onions, all held in check by plump, chewy grains that despite their new clothing seem to retain all the wholesomeness of a bowl of hot cereal. Not that I want to mislead you into thinking upma will be much like a bowl of hot cereal; for better or for worse this is a pretty exotic breakfast experience. If you already love salty, spicy things at this hour you’ll probably be in heaven. If, however, your tastes lean more to mine you might want to lessen the blow with some fruit or yogurt alongside, or perhaps a mug of sweet, milky tea. Then again, you could also just put off making upma until later in the day – I can tell you from experience that it also makes a easy, filling and fragrant lunch or dinner. And don’t worry, I’ll be the last one to pass judgment if this is how you end up preferring it. I don’t make any claims to authenticity here, but I doubt that will bother anyone; most people seem eager to put their own spin on upma. 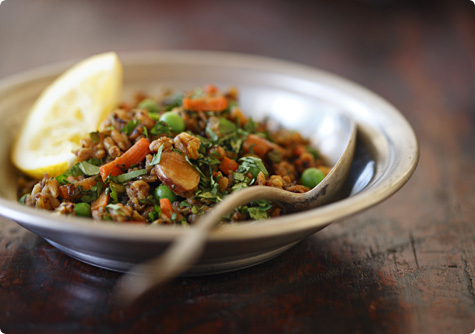 This is a great use of leftover cooked grains, but you can certainly cook them to order too. The seasonings are also fully modifiable depending on availability and personal taste – omit the curry leaves if you can’t find them, for example, or the garlic if you’ll sharing breathing space with sensitive co-workers later in the day. Likewise use the vegetables as guidelines: maybe throw in some frozen green beans or a leftover cooked, cubed potato if you have one on hand. If you’re short on time, skip the browning of the onion and just throw it in with the garlic and ginger for a few minutes; if you have the time, though, the sweetness of caramelization adds a lot of depth. As for how to eat it, I loved it both hot from the skillet and barely warm a few hours later, and if you’re hankering for a little more protein, a fried egg goes great alongside. Oh, and one last thing: upma keeps beautifully in the fridge, so make a big batch and eat it over several days, heating it briefly in the microwave or in a lightly oiled skillet. Heat a large skillet over medium-high heat and toast the coconut, stirring constantly, until golden. Remove and set aside. Add the oil and cashews to the skillet and fry, stirring constantly, until the cashews are golden and fragrant. Remove with a slotted spoon and set aside. If you’re not pressed for time, add the onions to the pan and saute until golden and caramelized in spots, about 12-15 minutes, and then add the garlic and ginger and fry for about a minute. Otherwise, add the onions, garlic and ginger all together and fry for about 5 minutes, until the onions are soft. Add the chilies, mustard seeds and cumin and fry, stirring constantly, until the mustard seeds begin to pop, 1-2 minutes. Add the carrot, peas, tomatoes and a generous pinch of salt, and stir for 3-4 minutes, until the tomato begins to soften and collapse. Add your grains and stir for another couple of minutes, until any stray liquid has evaporated and everything is sizzling. Stir in the reserved coconut and cashews, the chopped cilantro and salt to taste and remove from the heat. Squeeze some lemon juice over the top and serve. I often have oatmeal or toast with butter for breakfast, I guess I often skip breakfast and opt for coffee. Not healthy I know, but it takes me a few hours to want to eat. And then of course I overdo it. My mother is Korean so we ate savory for breakfast growing up – rice, seaweed, soups, and even kimchee. My favorite breakfasts often are the savory leftovers from the night before. I’ve never had or heard of upma, but looking forward to giving it a try. This looks like something I would likr yo dive into for breakfast. I’m more the savory breakfast type — when I feel like eating breakfast. I think I’ll have to get the ingredients to give this a try. I love untraditional breakfasts, and that looks smashing! Wonderful presentation and clicks !! Wow. Thanks for sharing this recipe. I can’t wait to try this! This totally looks so delicious. Looks like a great dish. Thanks for sharing this. along the same lines as kedgeree maybe? or leftover indian takeaway… i like a bit of sweet with my salty – think bacon and maple syrup – so maybe some mango chutney alongside. will definitely ensure some leftover rice during the week and give this a go. Very interesting! I’ve been known to cook up a batch of peas and potatoes for breafast – somewhat randomly seasoned with whatever strikes my fancy. This looks like a great base for riffing. That upma looks yummy I can’t wait to try it out! Thanks for the recipe. This looks like a great dish. What a great lesson in breakfast foods. We’re such creatures of habit. Your upma looks very appetizing, although it requires quite a preparation. I’m afraid this simple fact rules is out as my breakfast option. But can it wait until lunch. Then, I’m all for it! Thank you for this splendid write-up. My friend Matt from Matt Bites told me there were just three blogs he READ for the words. Yours was one of them. Though I’ve been hearing your blog’s name throughout all the many corners of the food world, I haven’t had a chance to spend the proper amount of time here to take it all in. In short, your words (and photos) are beautiful. I’m so glad you’ve been nominated for the Saveur awards so that people like me–readers that love great writing–could find you. I love your blog and have been trying to pop-in as much as time allows to see what you’ve got simmering on your stove. This is an interesting twist on upma. Since many of your fans above seem to have commented on time being a limiting factor in making this for breakfast, I just wanted to say that cream of wheat is what is used as the base in a traditional upma. With frozen mixed veggies and 5-minute cook time cream of wheat, this dish comes together really quickly. It’s great with a side of mango or lime pickle (available at all Indian stores). Looks so delicious. Personally I like the chewiness of oat groats and quinoa rather than semolina. As a kid I would always complain when my mom made this! Now, grown up I do miss it, but tweaked with oats or qunioa. Thanks so much for sharing!! I eat savory food every morning for breakfast. Your one-week break is my every day meal. I don’t feel I’ve properly started the day unless I have something savory and spicy. Typically I do fried rice, kitcheree, garbanzo bean flour chillas (pancakes kind of like dosas), uppama, poha, or congee. Occasionally I do like yogurt with honey and fruit though, although I miss my chiles in the AM when I do that!And coffee – of course! I agree, breakfast should be interesting. It sets the stage for the rest of the day. With all those spices in there, this aught to wake up the mind along with the pallet. Thanks. hi Melissa! I’m catching up on 5 months of your posts now, believe me, you have been missed. So many great ideas!Shavuot is coming up next week, a Jewish holiday which is originally celebrating the reception of the Torah on Mount Sinai, and is also associated with wheat harvesting and eating dairy products… so this Sheera recipe is a nice option to make as dessert for the Shavuot family meal… I had it several times at various Indian meals, and that (along with Ghajeer Halwa – carrot sweet – to die for!) is my favorite indian dessert. It shouldn’t be too sweet, I think the amount of sugar in the recipe heena gave you should suffice. Yeah! I think I’ll bring this dessert! Sheera and Ghajeer Halwa, small portions side by side. I love your variation on upma, I will definitely have to try this one out. I made Upma the traditional way on my site, please do read it and see at : http://cuminandcardamom.blogspot.com/2010/09/upma-indian-polenta.html and the sheera recipe at:http://cuminandcardamom.blogspot.com/2010/07/satyanarayan-puja-sheera.htmlI was wondering if I could add a link of your site at my site? I understand that I am very new at blogging, but if you like my site , and only if you do, could you add a link of mine too.